Exploring the period of transition from medieval to modern times, this comprehensive encyclopedia covers all aspects of the European Renaissance and Reformation, from visual arts and architecture to philosophy, religion, and politics. Some 2,100 A-to-Z entries provide detailed information on three centuries that have defined the shape of modern Western civilization. The scope of this encyclopedia is the 14th, 15th, and 16th centuries, during which time the pivotal events of the Renaissance and Reformation occurred, irrevocably changing the future's course. 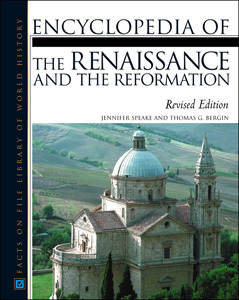 Encyclopedia of the Renaissance and the Reformation, Revised Edition is complete with an introduction, chronology, and bibliography, as well as a comprehensive index, approximately 100 black-and-white photographs, and an insert of 35 full-color images. An authoritative work for students and professionals alike, the encyclopedia is an accessible reference written with the non-specialist in mind. "Cross-references are very helpful, as are the suggestions for further reading. Highly recommended." "Facts On File has delivered another valuable general encyclopedia for the novice scholar...a welcome addition to high-school, undergraduate, and public libraries." "...an outstanding reference resource...The coverage of this book is thorough...The entries are concise, authoritative, and well written, and there are many illustrations...The quality of the resource is apparent...This is an excellent resource that will be useful in public and academic libraries, and might be a good acquisition for school media centers serving high school students." "The volume's strongest point is its broad coverage of lesser-known people, who are included along with outstanding leaders. The place to go for identification or brief background. Replace the old edition...Recommended." "...offers much useful information in a concise and accessible format."